Dr. Crosby’s career path began at Duke University. At Medical University of South Carolina in Charleston, he earned both MD and PhD distinctions. Internship at Harbor-UCLA Medical Center followed. Then, during residency in dermatology at Emory University, Dr. Crosby served as Chief Resident. With an unquenchable thirst for knowledge, he completed a rigorous Fellowship (accredited by ACGME) at University of California San Francisco, in Mohs micrographic surgery and procedural dermatology. 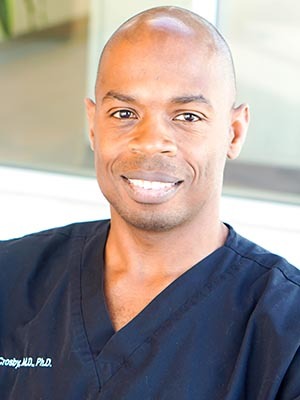 Dr. Crosby is one of just a few Fellowship-trained Mohs surgeons in the San Diego area. He takes a special interest in Mohs surgery and reconstructive dermatologic surgery for skin cancers. He understands that a skin cancer diagnosis can be devastating to a patient’s emotional wellbeing, and he sees the amazing impact of compassionate, effective treatment.